The 178 drives directly by our office. 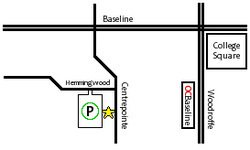 However, you can also take any bus that goes to Baseline Station and walk from there (approx 5 minute walk). There is a well-traveled pathway with good lighting located between the park and ride and main bus area at Baseline. For information on bus routes, please see OC Transpo’s Website.